Illustrated by hundreds of color photographs, NO WORRIES PARIS takes readers on a visually luscious journey along the city’s striking monuments, as well as into crannies of its villages and the full-on glamour of the fashion districts. Virtually all of Paris is covered in 10 Walking Tours, each with its own map. Walks take from a half-day to a day to complete, starting at one Metro stop and ending at another. The tours are complemented by 10 Walk Arounds, which are shorter in length, taking in the sights of a single attraction more on the fringes of the city’s arrondissements. Practical travel tips and get-around information is included. Newcomers will most likely want to begin with monumental strolls. Francophiles may choose something more edgy and out-of-the-way. The common thread is that each walk is along a visually aesthetic pathway that has a story of its own to tell. Readers who want to get to know Paris by seeing it on foot—pausing occasionally for a gourmet taste, park bench timeout or perfumed sniff along the way— have found the right book. 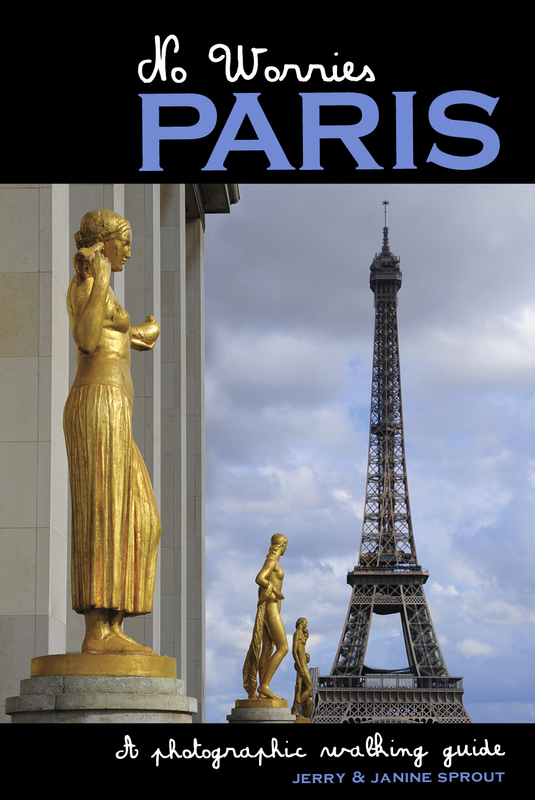 No Worries Paris is available on Amazon.com, Barnes and Noble, Powell’s Books, directly through the publishers (signed + discount) at Trailblazer Travel Books as well as your friendly independent bookstores nationwide.